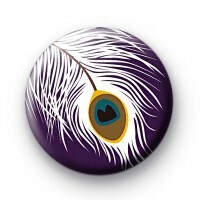 Peacock Feather Button Badge in purple with a lovely intricate and bold illustration of a peacock feather. The feather has white whisps with a yellow, blue brown & black centre. These badges are perfect for nature lovers, twitchers & bird watchers. We have a great range of animal inspired badges and bird badges. Take a look through our categories or have a little search for your favourite badges. 25mm button badge made in our UK workshop.